People using assistive technologies require the ability to navigate through form fields and elements in the correct order. They also require a textual description of each field so they can properly access the form information. CommonLook Office can handle Legacy form fields and ActiveX controls. While Legacy form fields are recommended for maximally accessible Word files, CommonLook Office will convert both Legacy fields and ActiveX controls to accessible form-fields in the generated PDF file. Form fields will be converted to PDF in the tab order in which they appear in the Word document. Tab order will be set to follow the logical structure of the document. Text Help will be converted to a tooltip. Radio buttons will be converted to mutually exclusive checkboxes that have the appearance of radio buttons. Enter the following attributes (or accept the default values) for each of form fields listed in the CommonLook Office panel. Press Next when done. Help Text: Typically assistive technology will read this text when the user lands on the field (the field ‘gets focus’). CommonLook Office defaults this text to a value based on the field’s context in the document. Maximum Text Length: The maximum number of characters that can be entered in the field. By default the field is unlimited. Width: The width of the field in the specified units. CommonLook Office defaults this value based on the location of the field in the document to maximize the field’s size when converted to PDF. For example, if the field is in a table cell, CommonLook Office will size its width so that it takes up all the available space in the cell. This is because fields in MS Word may allow entry of data beyond what would fit in the width of the field (provided that the Maximum Text Length allows it). 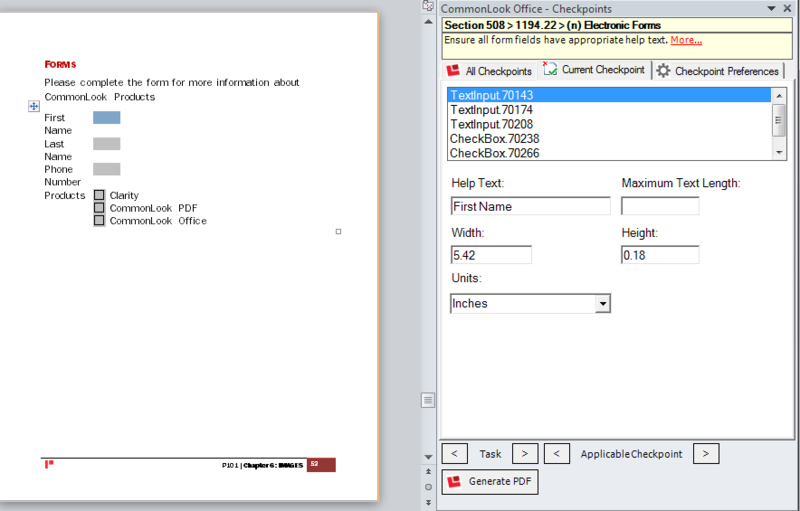 The PDF format, on the other hand, limits the data entry to what would fit within the width of the field. Height: The height of the field in the specified units. Units: The measurement units for the Width and Height. Note: Depending on the type of field, some of the attributes may be disabled. This checkpoint is relevant to the following regulations, guidelines and standards.